Fiberglass Tank and Pipe Institute serves to present piping solutions across industries that are tried and true. With an array of high-quality member companies who supply top-of-the-line products and systems, our site educates visitors and enables them to have access to leading materials and services. Whether you currently use fiberglass or have yet to learn about its several advantages, we encourage you to browse our site and see if you could improve your performance. Your job may depend on the fiberglass pipe products we recommend, which is the reason why we feature only the best of the best distributors. You need a resource you can trust to stay up-to-date with regulations, specifications, and the like. 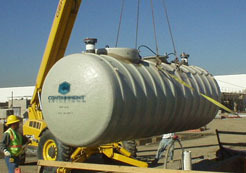 Fiberglass Tank and Pipe Institute is competent and committed to be that resource for you. Don’t miss our featured white papers that address a collection of topics and may help you decide whether fiberglass is for you. Are you looking for an affordable alternative to conventional steel piping? Corrosion-resistant fiberglass pipe is versatile and economical. The systems have many different applications and a number of gains. Analyze your current system to see if switching to fiberglass would make your job more efficient. Are you doing all you can to avoid those inconvenient, costly, frequent replacements? If you’re interested in learning more about fiberglass alternatives, take a few minutes to explore our available information. Go a step further and click on our member companies’ sites. A new and reliable supplier could be just a click away. You’ll find offered services and products from triple-wall underground storage tanks to ventilation ductwork. There isn’t much that can’t be customized to meet your specific needs. If you’re in a position to make a change, you won’t want to overlook this game-changer. Lasting success is worth testing the unknown. Process what you now know and contact us if we can further support your valued operations.